Slight edits were made to the original version of this article. 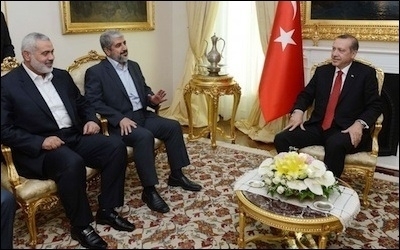 Turkish President Recep Tayyip Erdogan (right), seen here with Hamas leaders Khaled Mashaal (center) and Ismail Haniyeh in June 2013, famously declared that "there is no Islamic terror." Sadly, the free world feels compelled to partner with the wrong country in its fight against Islamic terror. The host of this year's G-20 summit, which came right after the Nov. 13 Paris attacks, was Turkey's President Recep Tayyip Erdogan. In his usual Sunni supremacist language, he accused the victims of jihad rather than the jihadists. "New tragedies will be inevitable," he said, "if the rising racism in Europe and other countries is not stopped. Racism, coupled with enmity against Islam, is the greatest disaster, the greatest threat." Yet Erdogan willingly ignores the rising racism, xenophobia, and anti-western, jihadist sentiments that increasingly command the hearts and minds of his fellow Turks. A quick look at a few sports games and fan behavior in recent weeks would reveal much about the Turkish mind and heart. Erdogan ignores the jihadist sentiments that increasingly command the hearts and minds of his fellow Turks. On October 13, three days after a twin suicide bomb attack in Turkey's capital, Ankara, killed more than 100 Kurds and pro-Kurdish, leftist and secular Turks, the central Anatolian province of Konya, a hotbed of political Islam in Turkey, hosted a Euro 2016 football qualifier between Turkey and Iceland. Before the kick-off, both teams stood for a moment of silence to protest the bomb attack -- a typical gesture to respect the victims. Sadly, the moment of silence was marred by whistles and jeers: apparently the football fans of Konya were protesting the victims, not their jihadist killers. Anyone under the impression that the whole world stands in solidarity with Paris should think again. Hundreds of Turkish fans booed and chanted "Allahu Akbar" ("Allah is greater" in Arabic) during a moment of silence for the Paris attack victims before a Turkey-Greece soccer friendly. Once again, the Turks were exhibiting solidarity with the terrorists, not their "infidel" victims. More recently, on Nov. 21, Turkish police had to deploy 1,500 policemen so that Turkish fans could not harm the visiting Israeli women's national basketball team. One thousand five hundred police officers at a women's basketball game! Despite that, Turkish fans threw objects at Israeli players as they were singing Israel's national anthem. Fans also booed the Israeli players while others applauded the fans who threw the objects. 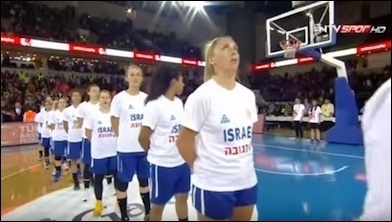 Turkish fans threw trash at the visiting Israeli women's national basketball team last week. Unsurprisingly, Turkish fans waved Palestinian flags. Israeli women basketball players were barred from leaving their hotel other than for training and the game. None of that is surprising although, at least in theory, Turkey is a candidate state for membership in the European Union. A new study by Pew Research Center revealed that 8% of Turks have a favorable opinion of the Islamic State (IS), higher than in the Palestinian territories, where support for IS stands at 6%, and only one point lower than in Pakistan. Nineteen percent of Turks "do not know" if they have a favorable or unfavorable opinion of IS -- which means 27% of Turks do not have an unfavorable opinion of the jihadist killing machine. That makes more than 21 million people! Of the countries polled, Lebanon boasted a 100% unfavorable opinion of IS and Jordan, 94%. In Indonesia, the world's most populous Muslim country, 4% reported a favorable opinion of IS, half of Turkey's. This is Erdogan's "neo-Ottoman" and increasingly Islamist Turkey. After the Paris attacks, this author saw tweets that called the victims "animal carcass;" that said "now the infidels will lose their sleep out of fear;" and others that congratulated the terrorists "who shouted Allahu Akbar." Meanwhile, and so funny, the free world cannot see that its ally to fight the jihadists is another jihadist. How should Erdogan fight Islamic terror – something he does not believe exists? One of Erdogan's famous remarks is, "there is no Islamic terror." But he thinks that "just like fascism," Zionism is a crime against humanity. There is a Turkish saying that could perhaps describe the free world's alliance with Erdogan's Turkey against jihadist terror: "Kuzuyu kurda emanet etmek" ("to trust the wolf with the sheep").